Offered is a fabulous, set of eight, 1960s silver plate golf club shaped cocktail stir-sticks. The set are perfect for any golf enthusiast or country-club inspired bar. Fairly heavy, considering their size. Offered is a gorgeous, set of eight, 1960s silver plate dragon motif spoons and spoon rests. Eight spoons and eight spoon rests. Offered is a beautiful, set of six, 1970s Dorothy Thorpe stemless cocktail glasses. The set has a minimal, yet striking silver rim along the lip of each glass. Offered is a fabulous, 1960s Italian black marble angular wine chiller with a polished-brass lip. Heavy. Vintage 1960s set of five clear glass hollow stems coupes. No maker's mark. Vintage 1960s set of four pheasant bird barware glass bar tumblers. Vintage 1960s set of four pheasant glass bar tumblers with gilt rim accents. Light wear to rims. No maker's mark. 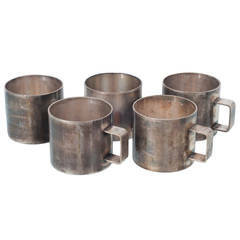 A set of 18 silver plated beer mugs, sold separately.